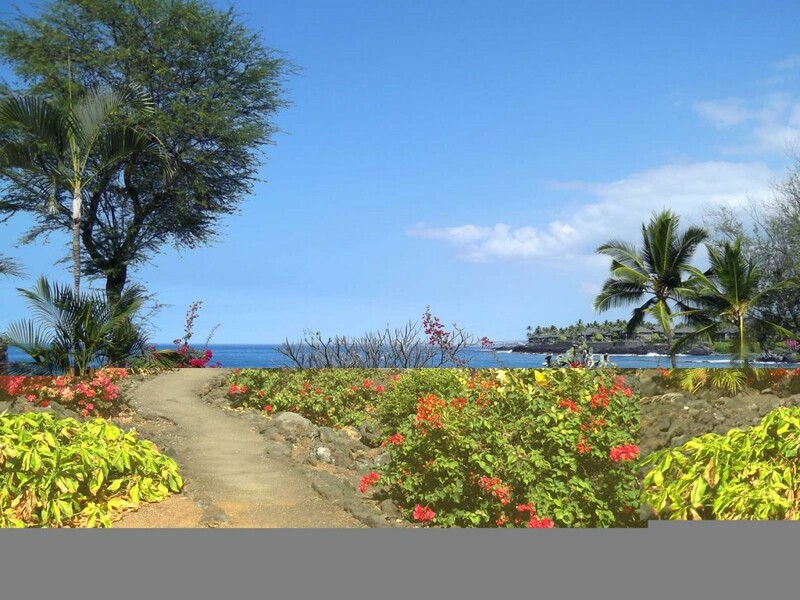 Like many Hawaii resorts, the Sheraton Keauhou in Kona on Hawaii’s Big Island has a huge plot of land with a fair amount of ocean-front territory. Not all resorts take the expense of making that land into a beautiful garden with a walking path though. This small garden of native and imported tropical plants greets visitors and locals alike with pleasant beauty and color, which is a stark contrast to the surrounding lava rock coastline. Signage in front of the garden explains the history of Keauhou Bay and He’eia Bay that can be seen from the pathway. Behind this garden is a small wedding chapel, luau grounds, and one of our favorite wedding venues complete with Hala trees and large expanses of soft grass.